New dream job, as of today: designing military insignias. Someone has to do it, apparently, as evidenced by the below image, which appears on the shoulders of American soldiers currently fighting in Iraq. A bit busy, is it not? I can’t help but to look upon it and wonder if its designer attempted to pack a little too much symbolism into it. As always, Wikipedia comes to the rescue and explains it a bit. On a black shield with a 1/8 inch (.32 cm) gold border 2 ½ inches (6.35 cm) in width and 3 inches (7.62 cm) in height overall two crossed silver scimitars points down with scarlet grips, superimposed in base by a wreath of palm in proper colors joined at the bottom with three loops of brown twine, overall a gold human-head winged bull of Mesopotamia, all below a gold seven pointed star… The star represents a vision of unity for the seven peoples of Iraq (Sunni, Shia, Kurd, Turkoman, Assyrian, Yazidi, Armenian) leading to a more secure, prosperous and free future for Iraqis. 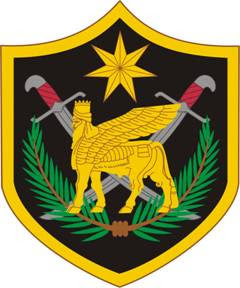 The crossed scimitars of the insignia recall the partnership between Multinational Forces and Iraqi Security Forces essential to bringing a democratic way of life to Iraq. The palm fronds symbolize peace and prosperity for a new nation. The colossal statue of the Mesopotamian human-headed winged bull recalls the rich heritage of Iraq and underscores strength and protection for the people of Iraq… The shoulder sleeve insignia was approved on January 7, 2005. The insignia was amended to change the symbolism on February 25, 2005. Amazing, right? And don’t you feel just a bit stupid for not realizing that the hoofed, winged sphinx represents Iraq rich history? You probably though it foretold the coming the actual human-headed bull that needs to appear on Earth before this “military operation” will finally be done with. I can’t help but imagine the pitch for this symbol: The designer, standing before a room elementary school book report-style, explaining what the seven-point star does and why it’s important. He apparently sold it, but I wonder if the proposal would have been accepted all the more enthusiastically if the eighth-inch gold border were described as “a racing stripe — you know, for speed.” At least whoever made this knew something about Iraq. At least the final product is something more culturally appropriate than, say, Abraham Lincoln riding a screaming eagle that’s raining red, white and blue lasers down upon people in turbans — all imposed over a crossed pair of Slim Jims in place of where the scimitars are in the real insignia. But even then the racing stripe would do a lot to help. i think the military would be a lot more efficient if it hired you to design military insignias. For instance, you could draw one for the u.s. marine corps one that would just depict a man very much resembling the picture of paul that you drew a week or so ago -- the one that i have on the Wall of Drew that says something like "my name is paul, and i will take your photo even if you don't want me too." but instead of a camera, he would have a gun, or a nuclear bomb, or something. Like you portrayed "paul," it would portray a very angry (and photo- or massacre-hungry) man; and, it would say something equally intimidating but intentionally mispelled. That extra "o" would certainly scare me off... so it could probably do wonders for the terrorists! Hey man. I think it's Blogger's doing, these strange links. Not sure why this started all of a sudden, but it has something to do with the lists of blogs that I follow, which have been in the righthand column for months now. And it seems to be happening only to other Blogger blogs. I'll see if I can make it stop.